Photographer Maxim Senin captured this "one-in-a-million" fireball during the peak of the Perseid meteor shower on Aug. 12, 2017, while observing with his family from Templin Highway near Castaic, California. When the Perseid meteor shower peaked over the weekend, no one was expecting an amazing show. After all, the August moon had just passed its full phase and threatened to outshine all but the brightest Perseid fireballs. Yet one dedicated stargazer, Maxim Senin of Redondo Beach, California, ventured out in search of dark skies anyway to see what the 2017 Perseids would bring. The result, he said, was a one-in-a-million meteor photo. "Although everyone predicted that the moon will whitewash all the meteors, when this one exploded I could hear 'oohs' and 'aaahs' across the valley," Senin, a veteran night-sky photographer, told Space.com in an email. "It was a bright as the moon itself, and left behind a smoke trail that was visible for 10-15 seconds after the meteor extinguished." The brightness of the moon, which was three-quarters full, ultimately was an unexpected asset. "In fact, thanks to the moon, the smoke trail was highlighted so well," Senin said. "One in a million!" Senin said he and his family spent about 4 hours observing the Perseid meteor shower. They averaged about one meteor every 3 minutes, and every third meteor was a bright one, he added. "Sometimes there was a 10-minute pause, and sometimes you could see 3-4 meteors shoot in a minute," Senin said. A Perseid meteor streaks over National Park Galicica Ohrid, Macedonia, on Aug. 12, 2017, in this view by astrophotographer Stojan Stojanovski with the Ohrid Astronomy Association. Senin wasn't the only one to snap a stunning view of the 2017 Perseids. In Ohrid, Macedonia, Stojan Stojanovski and his fellow members of the Ohrid Astronomy Association photographed the Perseids from a spot in the country's National Park Galicica. 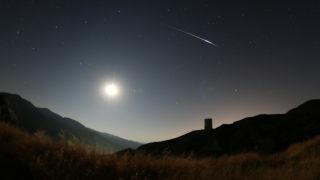 In an email, Stojanovski told Space.com he captured one stunning photo of a Perseid meteor, but the bright moonlight limited what he could see. The Perseid meteor shower is an annual celestial display that occurs when the Earth passes through a stream of dust and debris left from Comet Swift-Tuttle. This dust and debris burn up in the atmosphere to create bright meteors. The meteor shower typically offers between 80 and 100 meteors an hour to observers with dark-sky conditions far away from city lights. The 2017 Perseids peaked on Aug. 12, with the bright moonlight limiting meteor visibility to about 40 of 50 meteors an hour, according to a forecast from NASA meteor scientist Bill Cooke.